Key West @ mile marker 1 or Key Largo @mile marker 100 are both in the Florida Keys. They both hold all the natural pleasures you could want out of life…swaying rubber and tall palm trees, quiet beaches, and abundant wildlife, just to name a few. It’s a place to lie back, Get something organic to drink, and relax and forget about everything for a while. That quiet, calm, inviting organic retreat from the hectic un-organic world says it all about these 2 mattresses. And they are still the most popular latex mattresses we offer. Stretch out on these zoned latex mattresses custom made for The East Coast Organic Mattress Store® Inc. and you’ll see what we mean. We also use organic cotton flannel ticking made in South Carolina, in our diamond pattern(ticking) covering. 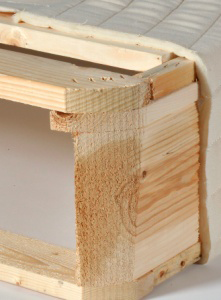 Inside, there is a 6 inch center core of odor-free natural white zoned Dunlop latex (rubber). The total thickness of this latex mattress is 7.5 inches. With the zoned cell structure of the latex, this natural rubber has the ultimate feel. Put it all together and you come as close to organic as you can get. You have just made it into the Florida Keys. You are entering Key Largo. Mile marker 100. Were talking beaches with umbrellas, sun filled days and quiet laid back nites. In fact nighttime in the Keys is the best time. The smooth, caressing waters, and the quietness on the Gulf side will remind you of this latex mattress. We named The Key Largo natural latex mattress after this exact feeling. This mattress makes you feel like a breath of natural fresh air. The Key Largo has no zipper, so you just flip this natural zoned latex mattress yearly. Simple as pie. The Key Largo natural latex mattress is by far our most popular mattress and the biggest seller, since it works for 75% off all people. 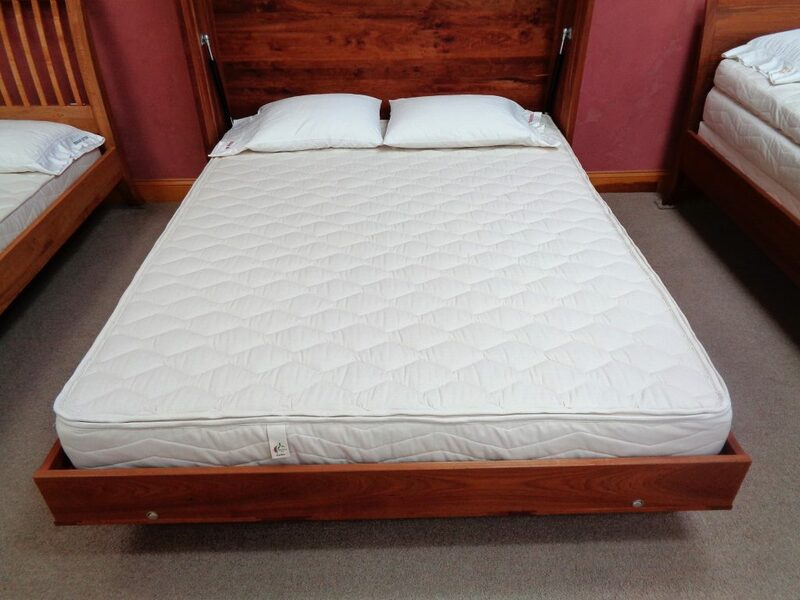 If your under 175 lbs this natural Dunlop latex mattress could be the one for you. Don’t confuse conventional rubber, and natural latex. Natural rubber is tapped out of trees, put thru a process,and comes out as pure as it can get. In the end your sleeping on natural latex, rubber, whatever you want to call it. Throw in Organic cotton sheets, organic cotton pillows, organic cotton cotton batting, organic cotton fill on our inner springs mattresses, and you take this mattress to the highest level. 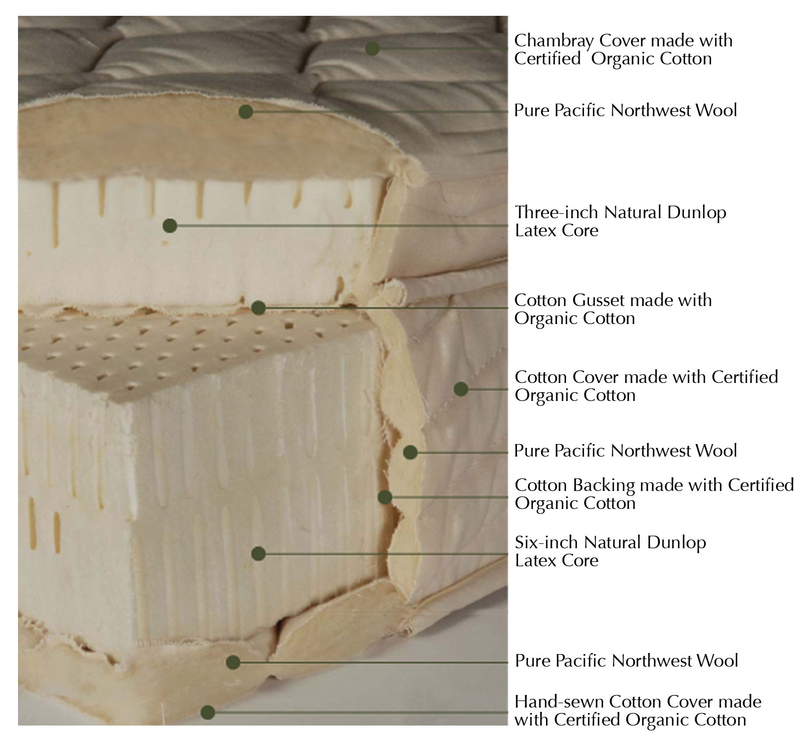 Protect your mattress with an organic wool or cotton mattress protector. MADE IN PENNSYLVANIA. This Dunlop rubber core is surrounded by organic cotton webbing. 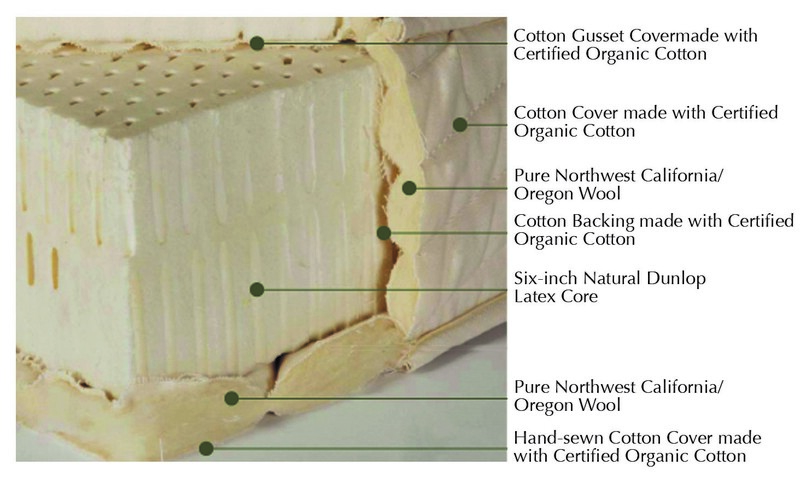 The padding materials under the top organic cotton fabric are made with a blend of certified organic fabric and Pure Pacific Northwest Oregon/California Eco Wool®. Wool is a natural fire retardant, and dust mite repellent. A zoned mattress has all the support in the center, but softer in the shoulder area. This rubber is finished off in our facility in Pennsylvania. This Natural Dunlop zoned rubber core is surrounded by organic cotton webbing, also certified organic. 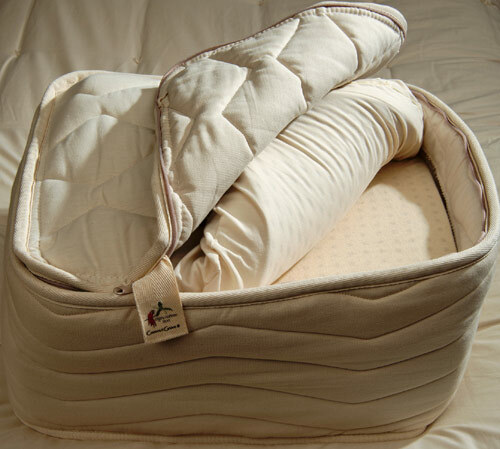 The organic padding materials under the top organic cotton fabric are made with a blend of certified organic fabric and Pure Pacific Northwest Oregon/California Eco Wool®. Wool is a natural fire retardant, and dust mite repellent. From one end to the other, this mattress has lots of organic good stuff in it. A zoned mattress has all the support in the center, but softer in the shoulder area. This rubber is finished off in a plant in Pennsylvania. 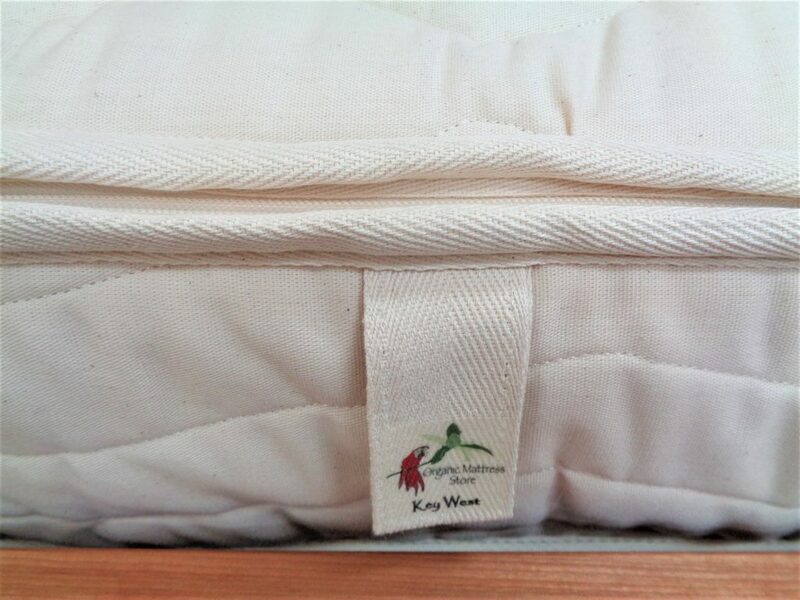 The Key West mattress has a removable zippered cover of certified organic cotton. Just unzip yearly and flip and rotate the core. 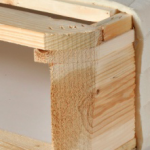 Zipper covers make it easy to replace a rubber core or a cover if need be. Spot clean the cover with organic vinegar and water. Do not wash the cover. Professionally dry clean only at a reputable green cleaner. The Key Largo has no zipper, so you just flip the mattress yearly. Protect your mattress with an organic wool or cotton mattress protector. …All mattresses are not created equal… Coconut Grove is located in Biscayne Bay near Miami, Florida. A place of swaying palm trees, fine organic outdoor restaurants, friendly organically thinking people from all over the world, and loads of organic sun. How much more organic do you want? Nighttime there is the time for people-watching, kicking back, and taking it easy. Let this mattress immerse your senses as it satisfies your desires. From the beginning of sleep to the end, let this mattress take you to a place of total serenity. When you are tired and want to relax, this mattress is waiting. The Coconut Grove® is ultimate bliss. This 10 inch thick Natural Rubber mattress is made to sink into with total comfort and support and has no grabby feeling.When it comes to built in pillow tops, this mattress outsells all the rest in our lineup. 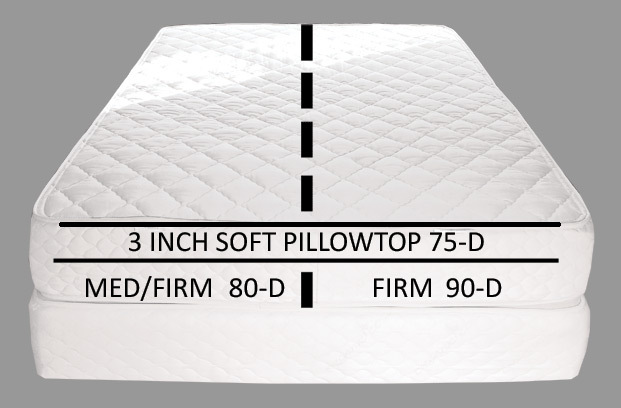 A zoned mattress has all the support in the center, but softer in the shoulder area. This rubber is finished off in a facility in Pennsylvania.